Ozark Adventist Academy admits students of any gender, race, color, national, and ethnic origin to all the rights, privileges, programs, and activities available to students at the school. It does not discriminate on the basis of gender, race, color, national, and ethnic origin in administration of its educational policies, scholarship programs, or any other school-administered program. We are authorized under Federal law to enroll non-immigrant students. 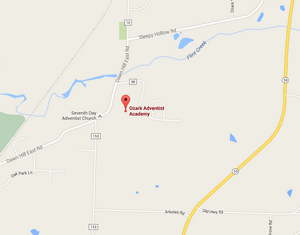 Ozark has been established primarily for the youth of the Seventh-day Adventist church. Students who come from a non-Seventh-day Adventist background may be accepted if space is available and if they agree to live by Ozark’s mission statement and our policies. Ozark is not equipped to meet the needs of students with serious behavioral or academic problems. We would suggest that those students seek educational institutions that are able to meet those needs. Students are expected to live in the residence hall if their parents or legal guardians do not reside in the local community. Any exception to this must be by request to the Administrative Council and approval by the Board. Please note that dormitories and cafeteria are closed when school is not in session. Most international students have family in the states to visit during vacations or breaks (Calendar of Events is below.) Students will need to provide their own health insurance. Parents and students should read and be familiar with the policies of the school. Please read the Student Handbook. Online Application/Enrollment Go to the Online Admissions page then click on create an account. Once you have created a username and password, click on Online Application/Log in. The tuition for the Aug. 12, 2019 – May 23, 2020 school year is $20,000 (Unfortunately, we are not able to offer financial assistance to International Students.) Once a student has been accepted and the tuition has been deposited to our account we will issue the I-20 and send it by express mail. You will then take the I-20 to the consulate in your country to obtain your student visa. Thank you for considering Ozark Adventist Academy as the next step in your academic career.